Also Recommended: Pokemon, Monster Rancher, Magic Knight Rayearth, any of the other Digimon franchise (but especially the movies and Digimon Adventure 02). Notes: Based on the Digimon series of video games. Since this is the first complete review we have, it is treated as the 1st OP, even though Carlos' review predates it. Seven children who couldn't have any less in common are sent to a summer camp, only to be transported into the "Digital World," where they encounter and befriend several "Digimon." Each Digimon is ironically complimentary to their vivid personalities, and they help them through not only survival of the savagery they encounter in this mysterious place, but also through some severe trials and tribulations that the young children left behind at home. Yeah, when you read that synopsis, you begin to realize that Digimon is, in fact, not a Pokemon rip-off. But you're a reader of THEM Anime Reviews, so you were smarter than that already, right? Now I could waste half of this review arguing why Digimon isn't a Pokemon rip-off, but instead, I'm going to treat this review (Poke-what?) like I would any other anime review. Mainly because I have so much to cover, having seen both versions of this series. I have had the fortunate opportunity to view both the American dub and the original Japanese, and I have favorable opinions of both of them. 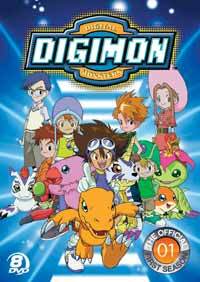 Sure, the dub "Digimon--Digital Monsters, Digimon are the CHAMPIONS!" is VERY VERY grating and nearly unbearable to sit through. Thank God nothing of great importance happens during those moments. (It's so easy to fast-forward the American theme song and the "Digi-volving" scenes. No big deal.) The Japanese background music is, to no surprise, far better than the Saban dub-overs, but what makes the dub so redeeming that the background music is forgivable is, actually, the voice acting. What starts out as rusty voice work quickly develops into phenomenal acting as the voice actors (especially Michael Lindsay (Joe) and Joshua Seth (Tai)) gain a better feel and appreciation for their characters. Very little was changed in the actual plot of Digimon, so I will speak on it as though they are one and the same. What makes Digimon such a great series, in my opinion, is the variety and poignancy of the issues that these children deal with. We don't have the angst that comes with teenagers in love, nor do we have the violence of adult drama. Each child has a unique personality, and realistic ways of coping with problems at home. Some of the problems the children are facing are shocking to begin with, but then we realize that it is those troubles that have shaped their character and their irrational behavior upon their arrival into the Digital World. The struggles we find are older brothers' senses of responsibility to their younger siblings (rivals Taichi and Yamato are both older brothers with chosen younger siblings...and how they handle their sister and brother is characteristically different--yet still similar), struggles with parents (Sora and her mother fight often, thus leaving Sora feeling superficially loving, when she harbors such bitterness), feeling of belonging (Koushirou, the boy genius, has a strong, loving relationship with his parents, only to realize that they stress over the fact that he was adopted after his parents were killed in a car accident), and acceptance. There is such a wide range of characters in Digimon, I find it hard to believe that anyone who watches the series wouldn't be able to sympathize or relate to at least one of the children. Additionally, what makes Digimon so profound is that the Digimon that befriend the children have as distinctive personalities as their children counterparts. For someone who has never had an appreciation for anime mascots, my infatuation with the seal-like Gomamon brinks on the rim of being unhealthy. What begins as a story of survival and adventure gradually turns into one of coming-of-age and self-discovery. Digimon is a heartwarming anime that introduces characters and relationships that are, as I see it, timeless and nostalgic. It sparks the imagination, and makes you appreciate the value of friendship and teamwork ... like any good Japanese program should. Recommended Audience: Again, mostly children's fare, with little to no offensive material.